Duckett: At the end of the day, we need to provide competitive rates and make everything simpler, faster. 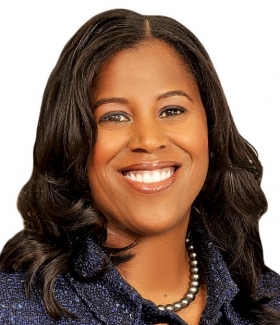 SAN FRANCISCO -- Big auto lender Chase Auto Finance, which slowed its rate of increase in lending last year, plans to stay prudent in 2015, says CEO Thasunda Brown Duckett. The lender’s auto loan and lease originations increased just 5 percent in 2014, to $27.5 billion. In 2013, its year-over-year originations grew 12 percent, with double-digit increases in three of four quarters. Duckett, who is known in the industry by the nickname T, spoke with Automotive News Special Correspondent Jim Henry here last month on the sidelines of a panel discussion hosted by J.D. Power and Associates. Based on numbers for the fourth quarter of 2014 (up 8 percent year over year to $6.9 billion versus a 16 percent rise in 2013) and the full year, it looks as if Chase Auto Finance has slowed its rate of growth. Is that fair to say? If you look, all year there was loan and lease growth [for Chase] year over year. For the industry, if you look at what was driving the increase, a lot of it is subprime, and we didn’t really participate that much in that. What’s the outlook for 2015? For next year, we are looking to continue to grow. But it’s going to be prudent, disciplined growth. Unlike other bank lending units, Chase Auto Finance provides private-label loans and leases, currently serving Subaru, Mazda, Jaguar and Land Rover. Does Chase Auto offer leasing beyond what it provides those four brands? Subaru had record sales of more than half a million in 2014. Is Chase Auto doing anything special with Subaru? Is there any trick to its success in terms of financing? They have a very strong following and they understand their customer base. We do work hard understanding their business strategy. When you’re setting residual values [on leases], it’s important to have that understanding. There are no tricks. Subaru has a reputation for not doing much leasing. How about Chase Auto’s other brands? If you have a luxury brand [Jaguar and Land Rover], that’s going to be at the higher end [for lease penetration] than the other two [Subaru and Mazda]. A year ago, Chase Auto said it was concentrating on the larger-volume dealerships among the 15,800 stores it works with and terminating some 1,800 smaller-volume dealerships. How is that going? At the end of the day, it’s for us to be providing competitive rates and to make everything simpler, faster. We like to talk about smarter. The thing about [concentrating on] larger dealers was that one size doesn’t fit all.